I have to remember every now and again that it is possible to make a stunning card without a stamp in sight. I know, that is almost sacrilegious for a Stampin’ Up! Demonstrator to say, but you know ….. 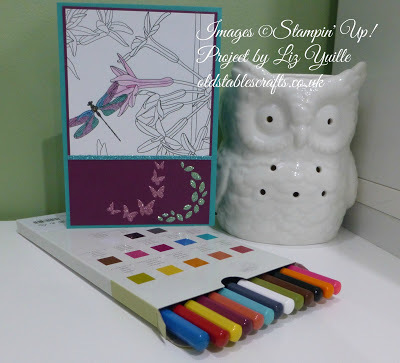 When I first got my hands on the Limited Edition Sale-a-Bration Glimmer Papers I knew I had to make as many cards as possible to showcase just how stunning they are. 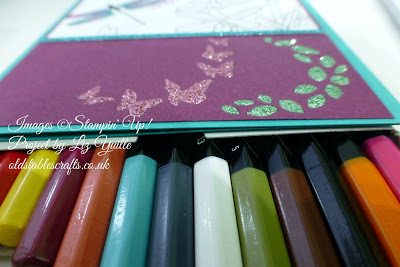 I have already shared some of these with you, but this one is slightly different because there are no stamps used. The paper is the Inside the Lines SAB Limited Edition Designer Series Paper, perfect to use with our fabulous Watercolour Pencils. These have already sold out in the USA once, and it looks like their stocks are low again both in the USA and in Europe, so you have been warned!!! For this card I only coloured the dragonfly and one flower, picking up on the colours that are in the Glimmer Papers. The butterflies and leaves are from the Timeless Tags Thinlits, with the Glimmer Paper inlaid into the Rich Razzleberry cardstock. As you asked so nicely, I will see what I can do about sorting one out for you! I have stuff already scheduled to go live for the next few days, so it I'll be in about a week or so.